Jibril Rajoub, one of the top officials in the Palestinian Authority's (PA) ruling Fatah party, openly supports Hamas's efforts to kidnap Israeli soldiers, Palestinian Media Watch reported Thursday. "If Hamas wants to kidnap Israeli soldiers, they should go ahead and kidnap Israeli soldiers," Rajoub stated earlier this month in a live PA television broadcast. "They should kidnap them if [the Israelis] refuse to release more prisoners, if they want to keep them imprisoned forever - only releasing them as ghosts or skeletons." 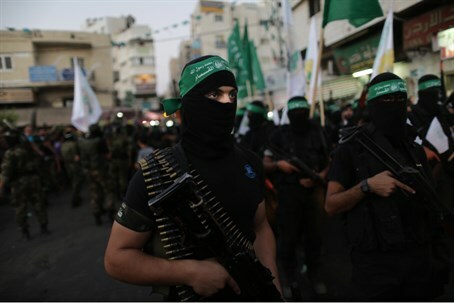 "If anything, we encourage Hamas to kidnap Israeli soldiers," he continued. "When they kidnapped [Gilad] Shalit, we welcomed it. When they performed the Shalit [prisoner exchange] deal, we had some reservations about it, but we welcomed it too." Shalit was imprisoned for five years in Gaza, then freed in October 2011 in exchange for more than 1,000 Palestinian Arab prisoners. The move was hailed as a huge success for coercing Israel to capitulate to Palestinian Arab demands - so much so that Hamas produced a film about the kidnapping in September. PA leaders’ approach of ostensibly supporting talks with Israel while threatening another terror war has led some Israeli leaders, notable among them Defense Minister Moshe Ya'alon, to accuse the PA of remaining openly hostile despite negotiations. This is not the first time Rajoub has encouraged open warfare against Israel. Earlier this month, the official promoted armed conflict against Israel in the event that talks fail in a broadcast on Iranian television.